Give someone a fish, feed them for a day. Teach someone to fish, feed them for a lifetime. I am passionate about developing others and drawing out the wisdom in the room. I see my role as an instructor sharing knowledge and experience, as well as a facilitator providing an engaging place for people to connect and learn from each other. Known for being fun, engaging, practical, knowledgeable and passionate, participants leave my sessions with more awareness about themselves and others, as well as a desire to learn more and apply their lessons. I customize my workshops to your timelines, desired outcomes and hot topics - coming to your place or hosting you in my space. 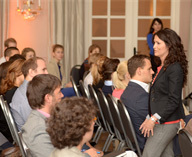 Workshops can be delivered in 2-hour, 4-hour or full day sessions. I also offer a 2-hour workshop + team facilitation to get into the depths of team dynamics - this approach gives everyone common knowledge and language as a starting point. Don't see what you're looking for? Contact me at 250.891.4330 or niki@nexusfacilitation.com with what you're hoping for and I'll let you know if I can cover it - or if not, who can. I customize my training to your timelines, desired outcomes and hot topics – coming to your place or hosting you in my space. Training can be in half-day, full day or two day sessions. Training is a great way to equip a team with common knowledge and language before important team meetings or change processes. "Conflict is not like wine. It doesn't get better with age." 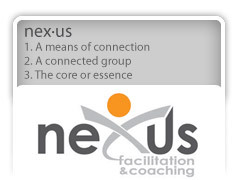 Brought to you by Niki Kux-Kardos, Nexus Facilitation & Coaching and Paula Drouin, ADR International Group, GET REAL courses help you discover a new way to interpret, manage, and rise above the conflicts in your family's business. GET REAL enhances your ability to have difficult conversations, offers practical tips on the quickest way to lasting solutions, equips you with ways to master the emotional climate of conflict, and helps you lead even the toughest discussions. Click HERE for a full overview of courses and topics. Don't see what you're looking for? Contact me at 250.891.4330 or niki@nexusfacilitation.com with what you're hoping for and I'll let you know if I can cover it – or if not, who can. "Niki is dynamo. She is passionate about everything she does and it shows. She is a great communicator and isn't afraid to tackle the issues head on. Time spent with Niki is well invested." "Niki is a very talented professional and produces impressive results in all projects she tackles. I would highly recommend her services to all levels of business. You won't be disappointed."